Indicates the ratio between the total carbon content of the melt and the carbon content of the eutectic composition according to eq. 1 under consideration of the influence of accompanying elements on the shifting of the eutectic point (eutectic, eutectic temperature). A degree of saturation Sc = 1.0 means that the iron corresponds exactly to the eutectic composition (see Eutectic cast iron). Degrees of saturation above 1.0 have hypereutectic cast iron and thus result in the structure formations of cast iron to be expected under consideration of the relevant wall thicknesses. In the chemical composition of flake graphite cast iron, carbon has the strongest influence on the strength. The lower the carbon content and the degree of saturation, the greater the strength because less graphite and more primary dendrites (see Dendrites) are present in the structure. Manganese, phosphorous, and sulfur in the usual contents have only a minor influence on the tensile strength. Inoculation treatment results in an increase of the number of eutectic cells (see Eutectic grain count) and thus in greater strength. The so-called Sipp diagram (Fig. 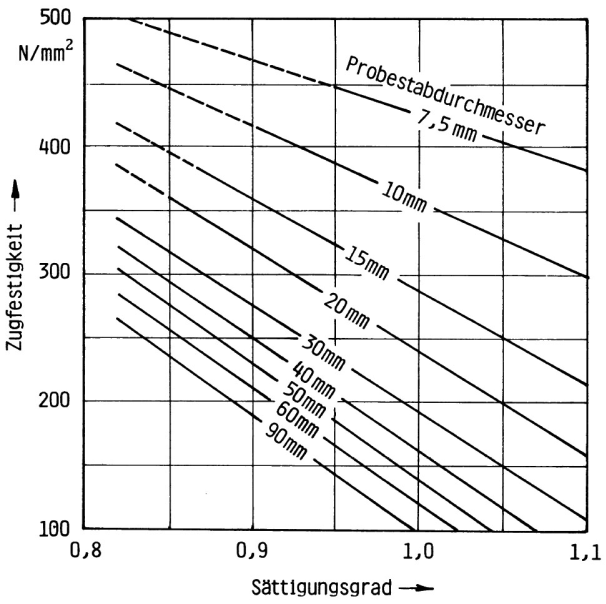 1) illustrates the correlations with regard to the material structure and the Heller-Jungbluth diagram (Fig. 2) those with regard to the tensile strength . 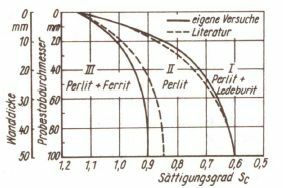 The quotient of measured tensile strength and calculated normal tensile strength indicates the so-called degree of normality, an important quality parameter of the flake graphite cast iron. There is a correlation between the degree of saturation and the carbon equivalent. For most applications, a gray, pearlitic cast iron with a degree of saturation of approximately 0.85 to 0.95 for wall thicknesses of around 15mm is preferred, with a carbon content of approximately 3.1 to 3.3% and a silicone content of 1.5 to 1.8%. As a general rule, the Si/C proportion for a given degree of saturation should be adjusted to a possibly high value.